Forget lattes and carb-heavy baked goods for today. 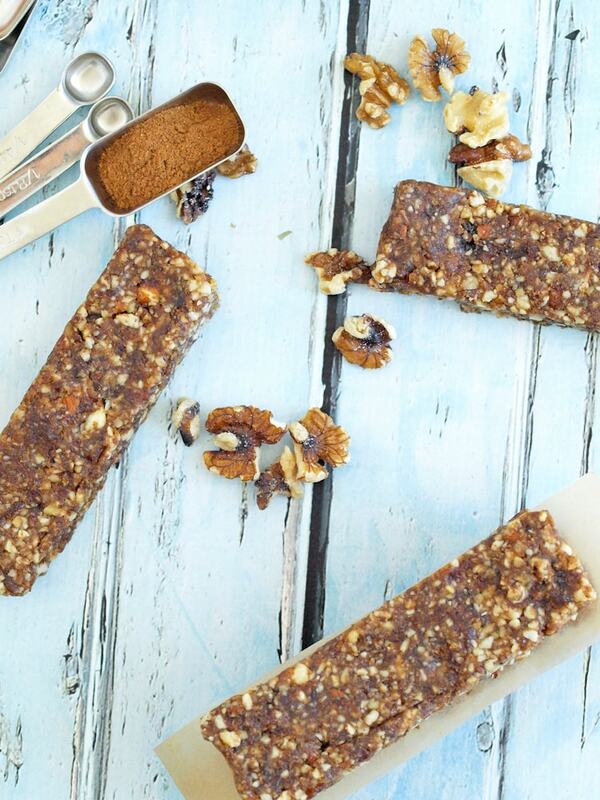 Let’s get our pumpkin fix from a nutrient-dense No Bake Pumpkin Spice Energy Bar! I’ve been rather wordy in my posts lately. The funny thing is, I’m kind of quiet in person. I despise small talk and am not the best at chatting it up at parties. Give me a blog, though, and a chance to write about food or health, and I just can’t stop. So I’m going to give you a break today and let the pictures do most of the talking. I think you can see what these energy bars are all about without me going on and on about how good they are. 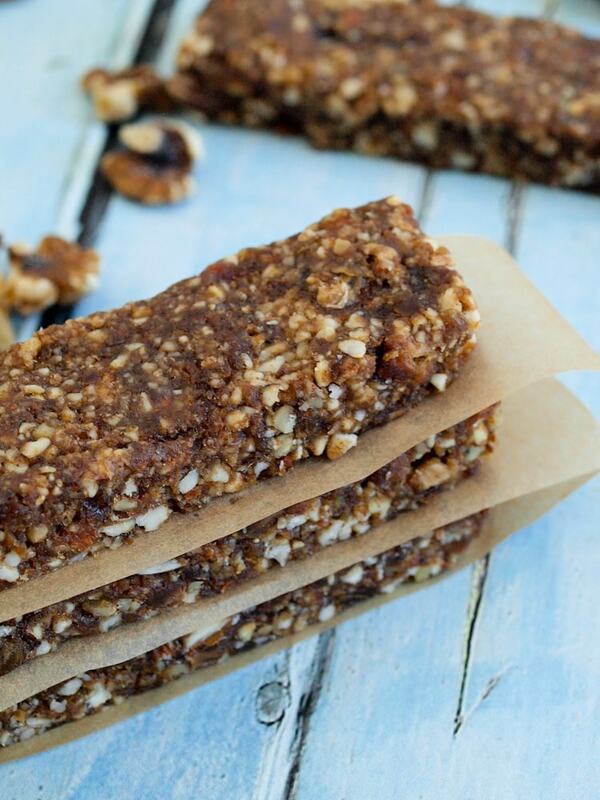 If you are like me and adore anything with pumpkin spice, you will love these bars. I made these into 7 huge bars. This created a big, filling energy bar. As made, they clock in at just over 300 calories. 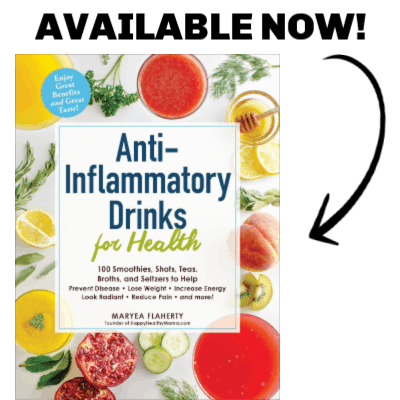 They are great for a quick breakfast or lunch. If you want a smaller snack size, you can cut each bar into 4 pieces and then you have a just-under-1o0 calories snack. 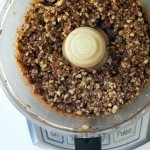 Another option is to use a larger pan to spread the mixture and make thinner bars. Mine were very thick. 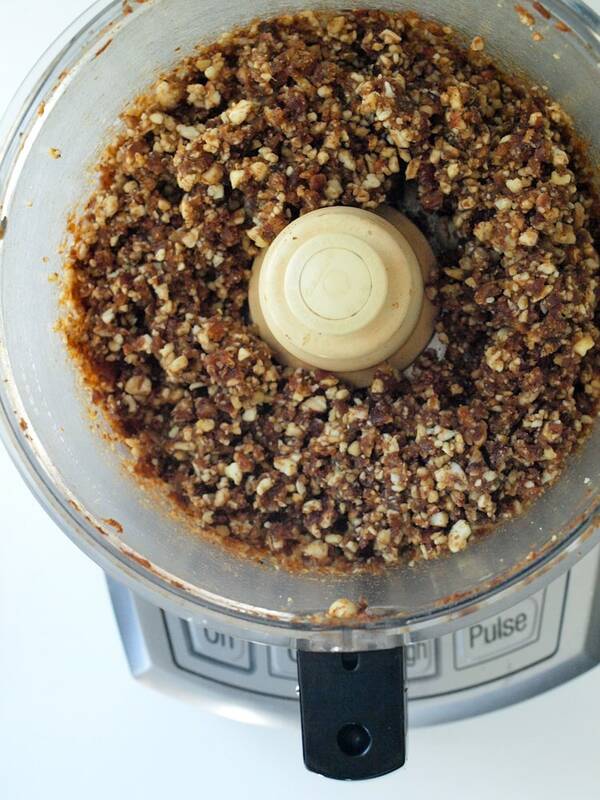 Place all ingredients in a food processor and pulse until the mixture is well combined, but there are still some chunks of nuts. It should look like this picture. In a parchment paper lined bread pan, spread the mixture and press it down firmly with a spatula. Pull the whole mixture out of the pan and cut into bars or bites of your desired size. Enjoy! These are the BEST! I love that there’s a whole tablespoon of pumpkin spice. You can never have enough cinnamon! Oh my, these look great, full of flavor and texture. These look absolutely wonderful! I tried pinning them but I think there is something wrong with pinterest right now because it says no images found when I put your link it. 🙁 Anyway, I HAVE to make these for my snacks next week. Thanks, Kelli! Thanks for letting me know the pin it button isn’t working properly. I updated my plug in last week and it’s been wonky ever since. Of course I am technically challenged and have no idea how to fix it. Made these last night and I’m snacking on one with my french press this morning. So tasty! I thought the 1 heaping tablespoon of pumpkin spice might be too much but it’s totally not overwhelming at all. Thanks for the tasty recipe. I might turn these paleo and use pecans rather than peanuts next time. Yes, I think you usually need more pumpkin spice than you’d think in order to create good flavor. I made a batch with less and they were bland. Good idea swapping out the peanuts for pecans. I may try that, too! I am so down with anything pumpkin spice! These look so good! 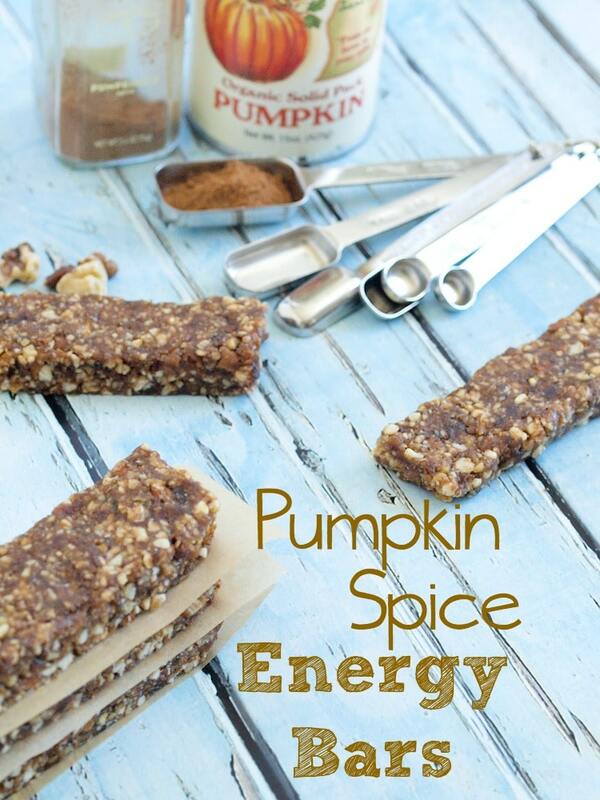 I love making home made energy bars or protein bars, and the idea of pumpkin spice, well, yum! I’d like to try replacing the peanuts with pumpkin seeds to make them extra pumpkiny. Perfect for this time of year. Thanks for a great recipe! These look fantastic. 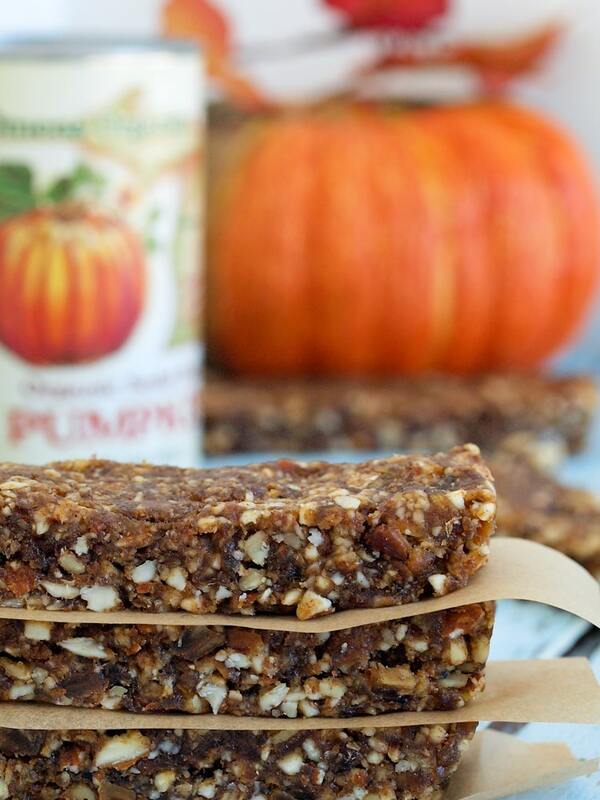 I never thought about putting pumpkin in my date bars-good thinking! i’ve never had a recipie where the pumpkin is uncooked- how long are these good for? We usually eat them up pretty quickly, but they should keep in the fridge for at least a week. What is in pumpkin spice since we don’t get that here in New Zealand? Is it primarily cinnamon and nutmeg based? Here are the ingredients on my bottle of pumpkin pie spice: cinnamon, ginger, nutmeg, allspice, white pepper. Hope that helps! Thanks Maryea! I made this but since our Tablespoons are bigger than yours, it had slipped my mind and I used two Tbsp of Rice Malt Syrup (no Maple in the pantry) but it was way too sweet and I think I overdosed on the pumpkin spice as it said HEAPED Tbsp and once again, forgot my head and put too much in!! So next time, I will go easy with the Tbsp measurements but for now, the whole concoction is in the freezer while I think about what to do with it. Might make a carrot cake and crumble it into there since it has the cinnamon flavour etc but omit quite a bit of the sugar from the cake. Ooh I didn’t realize your tablespoons are bigger. I hope you can salvage it! hi! I was wondering if there were any alternatives to date/if they are necessary? I just really don’t like dates, but these sound amazing! Thanks! Have you ever tried dates in a bar like this? You can’t really taste the dates, but they add the sweetness and help hold these together. You could try raisins. Hi! To replace the peanuts, can I just add extra walnuts and almonds? Or replace with pecans instead? 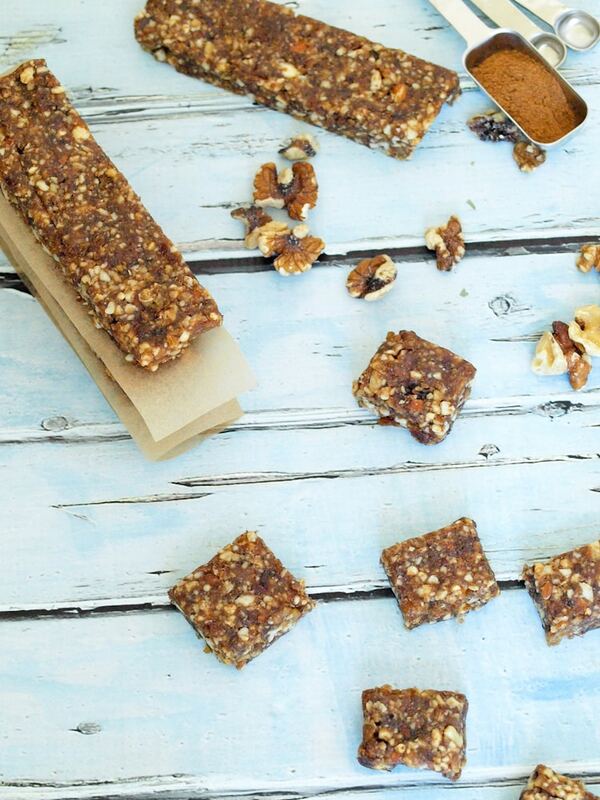 I love pumpkin everything and I LOVE making these bar and eating them. I dislike only using a small amount of the can of pumpkin puree. I just threw out a can that I didn’t use all of because it became moldy. I did get two uses out of the can before it molded. I only use pumpkin puree for this bar (typically). Wondering, if I could use applesauce instead??? So glad to hear that, Haley! Years after this was posted I just found the recipe and made them on a whim. I love these way more than any other name-brand bar I’ve bought before. I didn’t have pumpkin puree on hand, or pumpkin spice, so I just left the puree out and used cinnamon, all-spice, ginger and nutmeg. I also added a handful of pepitas instead of peanuts and threw in a dash of vanilla extract. So. Delicious.